All the Adventure stream Humans were up bright and early on Saturday morning. Well, early anyway. Some Humans were perhaps just a little less than 'bright' after some extracurricular research into Canberra's nightlife as detailed in my earlier post, Human Brochure - And so it begins… Yes, Craig, I'm looking at you! After partaking, some more, some less, of the tasty breakfast buffet at the Mantra on Northbourne, we gathered once more in the lobby for our coach ride to the National Zoo and Aquarium. Coaches and drivers were provided by Murrays and we must have lucked out because we were assigned one of their best drivers. Roy was a font of local knowledge, tourism information and really, really bad puns! As we were getting onto the bus, I managed to grab a couple of photos and these will lead me into what I think was one of the few failings of the organisation of the weekend. 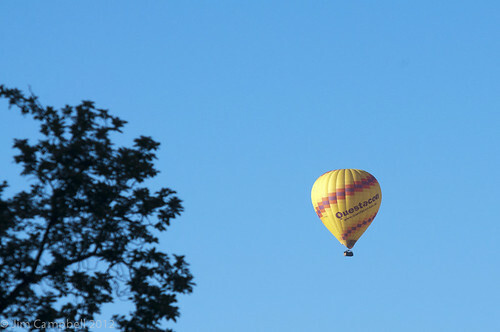 In the lead-up to the Human Brochure weekend, a balloon ride was talked about for the adventure stream but when the itinerary was finalised there was no mention of such a thing. 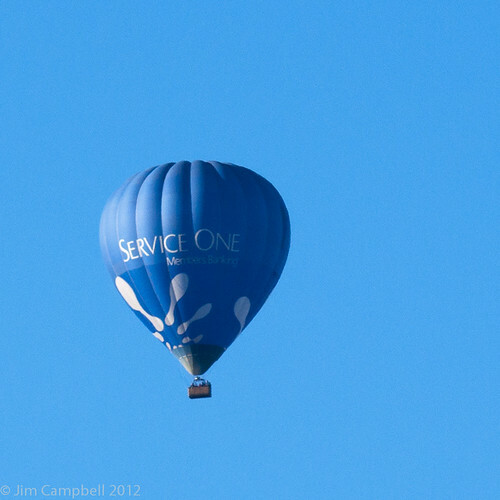 I admit that I was disappointed since I was really looking forward to such an adventure, but I accepted the explanation that there simply wasn't enough hot air balloons in Canberra for all of us. Then I started to notice what, in my previous profession, we would call "internet chatter" indicating that some Humans were still expecting a ride in a balloon. The retired intelligence collector and analyst in me couldn't let this go and it turned out that there was a secret cabal (not really, but it sounds good) of VIP Humans who were getting even better treatment than the rest of us. And we were being treated mighty fine, thank you. The eventual explanation of this was that these were people with social media influence greater than the average Human. Now, given that the 'average' Human selected for this weekend had been reported as having a social media reach forty-five times greater than the average (lower case) human, these people must be as gods to us mere tweeters. And I'm absolutely fine with that. It totally makes sense that if you have events with limited capacity, that you would utilise them where they would do you the most good. 'Good' in this case being in terms of social media reach. It was the crude attempt at secrecy that rankled with me and, I believe, with my fellow Humans. I hope that Canberra Tourism takes this on board and is more open with the Humans on the February weekend. The cat is well and truly out of the bag in any case. Anyhoo. To the zoo! I should note that it is 8:00 in the morning. The the first sign we see as we get off the coach says that the zoo doesn't open until 10:00. Something may have gone horribly wrong. But no! The zoo is opening, exclusively for us Humans, two hours earlier than normal. How good is that? 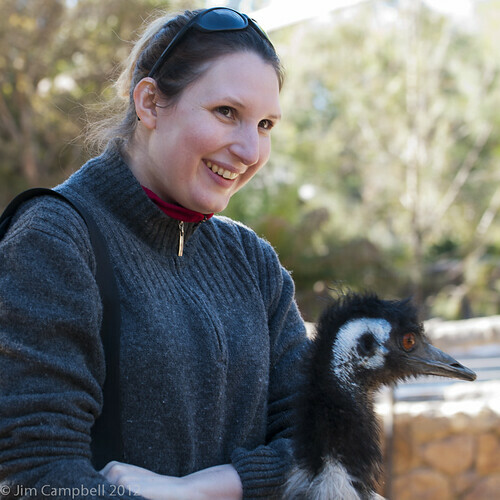 The National Zoo and Aquarium is, surprisingly, not an enterprise of the ACT Government. I am used to zoos being part of a statutory authority like Zoos Victoria, which runs the three main wildlife ventures in my home state. The National Zoo and Aquarium is a family owned business. As a photographer who likes to take pictures of animals, and as an animal lover, I find myself conflicted about zoos in general and inner-city zoos in particular. If you add in the concept of a private business trying to make a profit out of their venture, well, this could be bad, very bad. 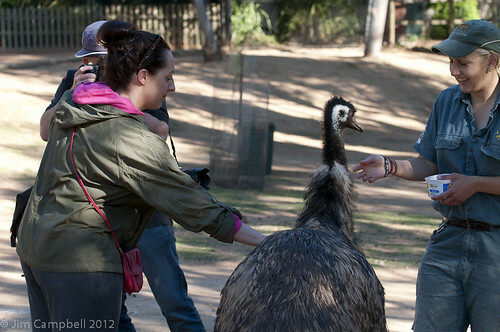 I remember the 'very bad' from visiting Melbourne Zoo in Royal Park as a teenager some forty years ago. 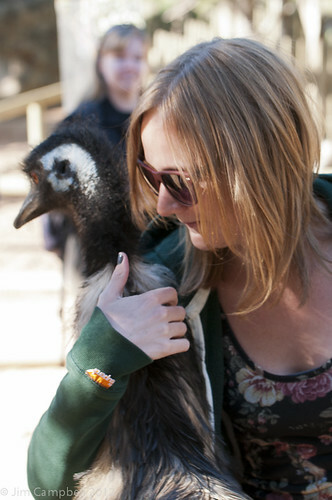 It was a sad place with bored animals in small wrought iron cages and bare concrete enclosures. 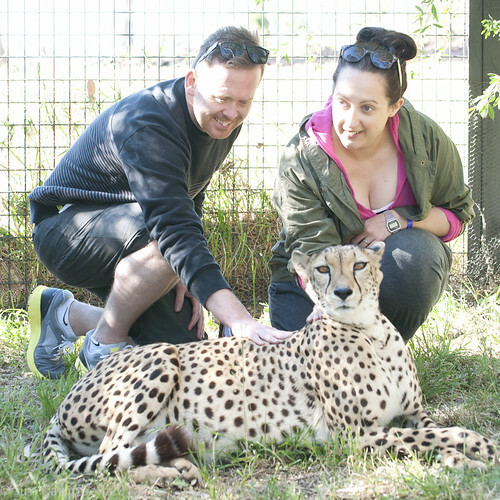 These days it is a much happier place to visit with much larger, more natural seeming enclosures and two other facilities, the Werribee Open Range Zoo and the Healesville Sanctuary where some animals can be "swapped out" to allow them to de-stress. This zoo seems to fit into the middle of that range. The enclosures are reasonably spacious and contain enough animals that they can be sociable, but they are not overcrowded. They are safe for the animals (and visitors) and contain both natural and man-made environments to ensure that the animals are sheltered and amused. I also heard from one of the keepers that more land has been sourced and the zoo is shortly to grow from the current 7 hectares to more than 60 hectares. That second figure is subject to my fallible memory and if it is wrong, it is my fault, not the zoo's. Anyway, after a brief introduction, we were split up into groups. 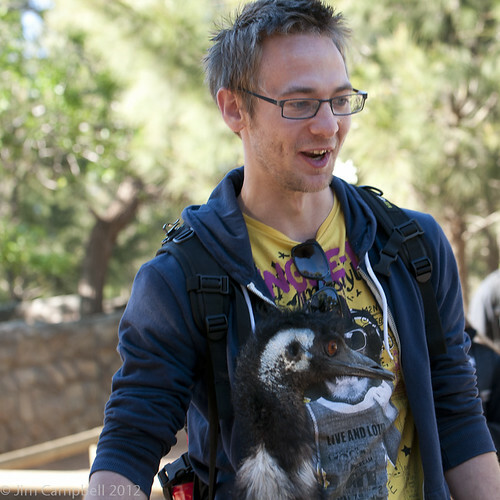 The idea was that each group would have one of the zoo's animal encounter experiences and then be free to wander the rest of the zoo at will. I got put in a group of twelve, which I immediately thought would rule out being in the group that would get, to my mind, the premier experience. But no! 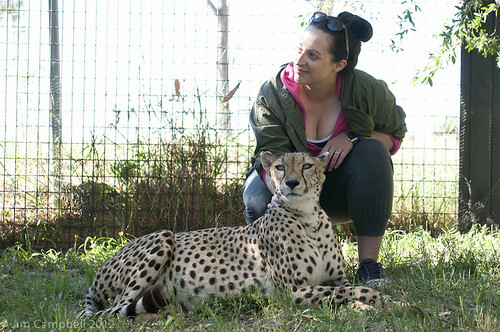 We were going to meet a cheetah. Not only meet her, but if she was in a good mood, we might even be able to pet her. This was going to be good. 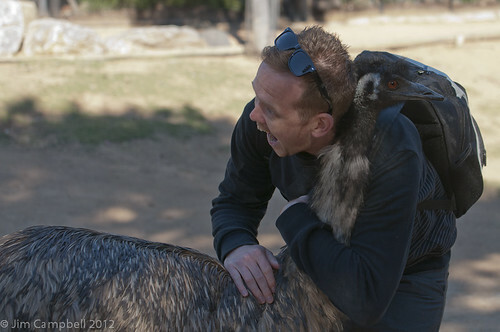 All zoos have to protect their animals from idiot humans (lower case) with sticks and inappropriate food, etc. They also have to protect the Humans from animals that bite and scratch. Some zoos have come up with excellent methods of doing both and still allowing good viewing and photography. The ultimate way of getting a good view and, of course, a good photograph, is to get into the enclosure with the animal. Needless to say, this doesn't happen very often. Our brave dozen were further split into three groups of four. While the first group went to meet the cheetah, the rest of us were guided around other nearby exhibits. 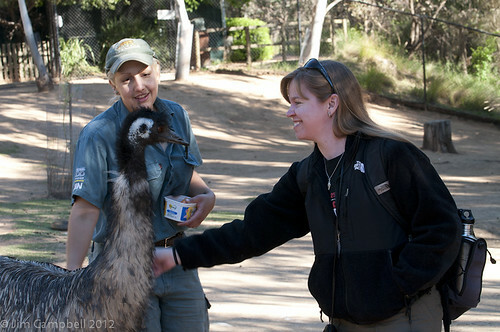 We feed treats to some clever lemurs and met an emu who likes hugs. No, I mean he seriously likes hugs! 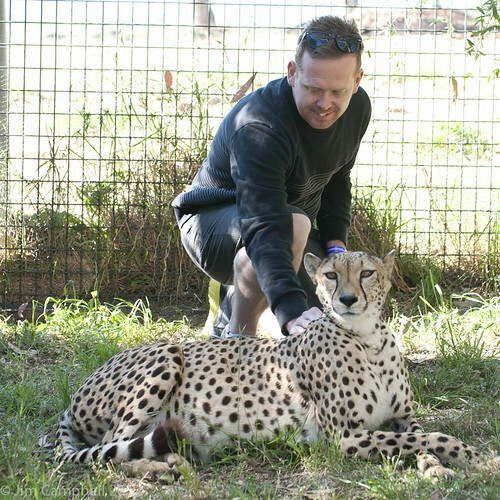 After a while the first Humans came out of the cheetah enclosure, grinning like fools for some reason, and I went in as part of the second group. We got a quick but reassuring safety talk and then in we went. 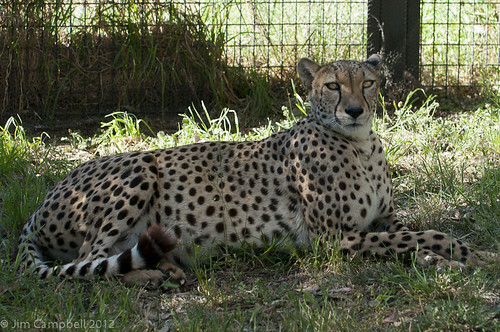 Without further ado, I give you Shasa the cheetah, representative of the fastest land animal on the planet. And, to be honest, a neck scritch loving, loud purring, kitteh! Then it was time for a tummy rub, which is a job for professionals. 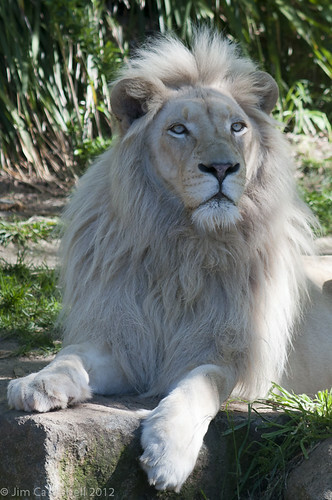 Note the non-retractable claws (unusual in a feline) which are mostly used as running spikes. Where the keeper is pointing though, is the killer weapon, the razor-sharp dew claw which is used to hamstring fleeing antelope and bring them down for dinner. Maybe not just a kitteh, then. 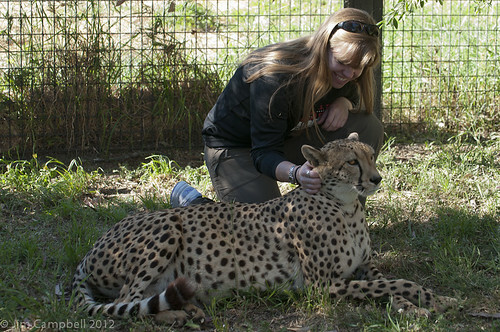 More information on my new friend Acinonyx jubatus from the ever-reliable Wikipedia. Grinning like a fool (I see where the earlier Humans got it from now), I went for a wander using the handy map the staff provided. Just one more photo. 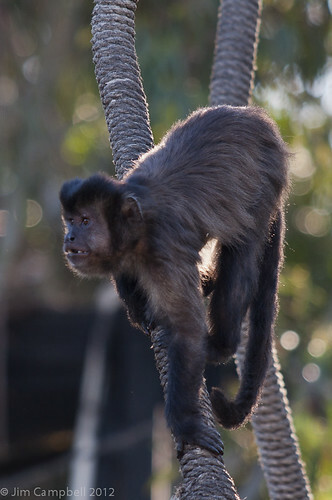 If you click on this or any of the other photos, you can see more of my shots from the zoo. Oh, just one more then. All too soon, our time was up and it was on to new adventures. That will be the subject of the next post. 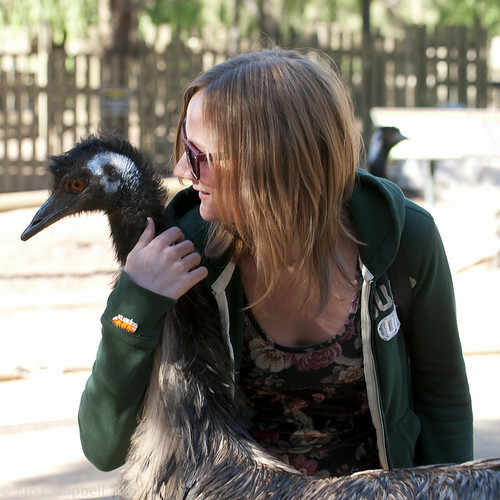 ps If you have any photos of me petting Shasa or hugging an emu, would you be so kind as to leave a comment with a link to where I can see them. Also if you are in any of my photos and would like to get a copy for yourself, leave a comment and I'll send you a version without the copyright watermark. Photoshop… hmmm. Photoshop? I've heard of it, but I've never used it. No, seriously, I do know what it is, but I don't use it. It's too damn expensive for one thing, and too damn confusing for another. Any sharpness and clarity that you see is due to a good lens on a camera with a decent sensor. Oh, and 40-odd years of experience, that's got to count for something as well, no? Painting secrets - applies to photography as well. Strobist - The one and only! Images are (CC BY-NC-SA 2.0) Jim Campbell & may be shared and adapted so long as you credit me. Awesome Inc. theme. Powered by Blogger.